Welcome back everyone to another Central PA Racing Scene hosted by yours truly Bill McIntyre. This week I want to touch on something I think might get lost once in a while, while we are sitting in the stand, on twitter, or even a message board complaining about our local racing here in Central PA. More on that in a moment. First off I want to wish Tyler Esh a very speedy recovery from a Fractured vertebrae in his spine suffered Saturday in a sprint car crash at Lincoln Speedway. Tyler was the leading rookie in the Central PA 358 Point Series presented by Capitol Renegade and an incredible young man. Hope to see Tyler make a full recovery and get back in the seat very soon. Congratulations to Lucas Wolf on picking up the Central PA 2014 Speed Week Championship last night at Selinsgrove Speedway. Many of you know that Lucas missed the Saturday nights race at Lincoln Speedway to be there for the birth of his first child a daughter named Vera. Congratulations Lucas on not only being crowned Speed Week Campion but more importantly, becoming a father for the first time. This past weekend while many of you where sitting at the track watching the 410's race fpr the Speed Week Championship I spent my normal 2 nights of racing at Trail Way and Lincoln Speedway's watching the 358 Sprint Cars in action. Something happened and it reminded my why I love going to the races and its not just to watch the man and woman who race these fire breathing machines go around in circles. Its to be with my family and Friends. Friday night I stood in the pits talking to "Big" Brad McClelland and his wife and while picking on Brad for not racing Saturday night what he told me his plans where made me remember why this sport is so great. Brad decided that it was more important to take his wife out for dinner on a rare Saturday night off from racing (For those that don't know, Brad is the crew chief for Steve Owings at Lincoln) then to go run the 6r machine. That is a man who has his priorities right. After watching the 25 lap 358 feature event I watched the family of Robbie Kendall all celebrate in VL as we always do at the track, and to see how close he is with his family really made me think about all the friends I have made in this area. Back in 2009 I started the Central PA 358 Point Series and over the past 6 years I have made numerous friends in the pits of our area dirt tracks. From the 1* gang of Timmy Wagaman who I have shared many an after race beer with to guys like Rob and Derek Sell who moved from Arizona to race sprint cars. Sitting here I can remember a young punk named Danny Dietrich running around the pits trying to learn how to drive a 358 sprint car at Trail Way Speedway while his brother Bill was cleaning up and running with Jeff Rohrbaugh. All of whom I am now proud to call my friends. Being there and seeing some young kid roll into the pit area in the famous Bobby Allen hauler and walking over and getting my first glimpse of A future World of Outlaws driver in Logan Schuchart and a year later his Uncle Jacob Allen. Walking through the pits opening night and seeing some skinny kid and his family unload the ugliest green car I had ever seen, and take that car and park it in Victory Lane his 3rd night out. 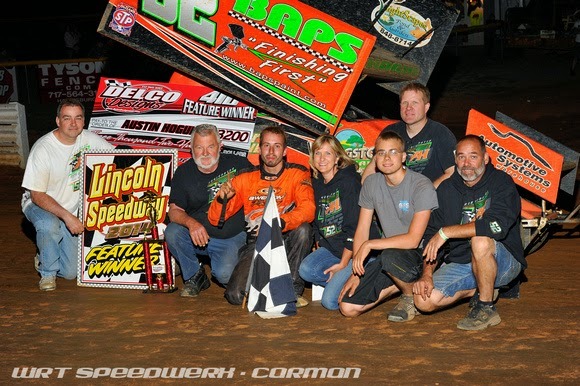 Now that kid and his family are not only the defending 2013 Central PA 358 Point Series Champions they also have won their 1st 410 race this season. That family is the Hogue Family, and that skinny kid is non other then Austin Hogue. I owe so much to that family. Their cousin Catherine was instrumental in helping me get the sponsorship from Capitol Renegade and I owe her so much for that. I can't say I have ever met a nicer family in a sprint car pit area. Saturday night I was reminded once again about Family and and friends. First off Saturday night was the night I was set to give out the 2014 CPA358PS Most Popular Driver trophy to Ashley Cappetta. I knew how hard Ashley worked to win that trophy and to see the smile on not only her face but her mothers as well when I walked onto the track with it made me once again glad to be just a small part of this great sport. Now that is why I love this sport so damn much. It's the friends and families in the pits and the friends and family's in the stands I have made over the years that mean the most to me. This sport is not all about a bunch of cars going in circles, its about the people we share our lives with each week at Trail Way, Williams Grove, Lincoln, Port Royal, Selinsgrove or any other race track in this great country of ours. With that I want to wish everyone a great week and thanks again for checking out my site. Don't forget you can leave a comment here (please leave your name don't be a damn chicken), you can tweet me @BillMcIntyreIII or hit me up by email at boogermac420@inbox.com. Thanks for playing along, and I hope to see all of my friends back at the track very soon. Can someone please pass the salt?? ?